Recent research indicates that a notable number of teachers are concerned with conditions of auditory impairment such as tinnitus, hyperacusis, and hearing loss. Studies focussing on characteristics and interdependencies of single hearing disorders (HD) are rare. This explorative study examines tinnitus, hyperacusis, hearing loss, and all possible combinations (tinnitus + hyperacusis; tinnitus + hearing loss; hyperacusis + hearing loss; tinnitus, hyperacusis + hearing loss) in German teachers. The impact of single HD on perceived distress, depending on the number and kind of comorbid HD, was of special interest. Information was collected via online survey and includes self-reported data as well as data from the Mini-Tinnitus Questionnaire (Mini-TQ). Results show that most of the 1468 participants (45%) suffered from two HD in different combinations, and the fewest (25%) were afflicted with only one HD. Considering the seven HD groups, most teachers (30%) suffered from all three HD. Across all groups, tinnitus was present in 1096, hyperacusis in 988, and hearing loss in 937 teachers. Multiple intergroup comparisons revealed that self-rated tinnitus-related distress rose significantly with the increasing number of HD. No significant differences were found for distress ratings of hyperacusis between the four groups including hyperacusis and between the four groups with hearing loss. In the Mini-TQ, groups including hyperacusis scored considerably higher than those excluding hyperacusis. The frequent prevalence of HD in German teachers points to a need of better noise prevention in German schools as one priority of occupational safety. The purpose of the study was to determine whether perceptual masking or cognitive processing accounts for a decline in working memory performance in the presence of competing speech. The types and patterns of errors made on the backward digit span in quiet and multitalker babble at -5 dB signal-to-noise ratio (SNR) were analyzed. The errors were classified into two categories: item (if digits that were not presented in a list were repeated) and order (if correct digits were repeated but in an incorrect order). Fifty five children with normal hearing were included. All the children were aged between 7 years and 10 years. Repeated measures of analysis of variance (RM-ANOVA) revealed the main effects for error type and digit span length. 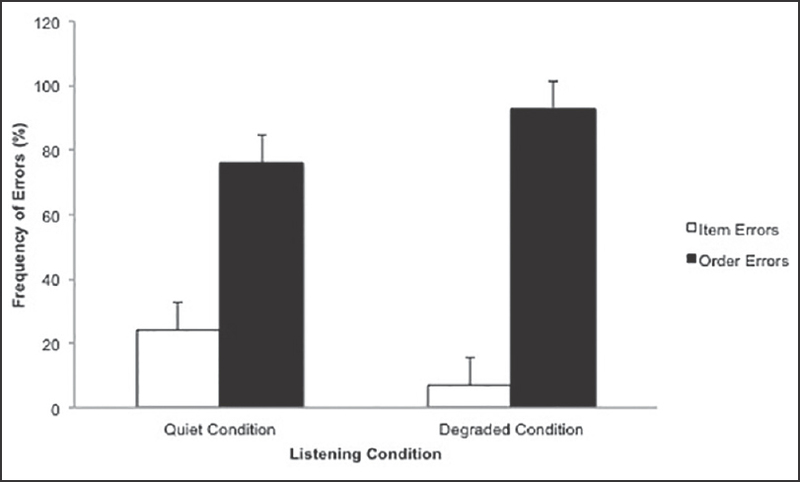 In terms of listening condition interaction, it was found that the order errors occurred more frequently than item errors in the degraded listening condition compared to quiet. In addition, children had more difficulty recalling the correct order of intermediate items, supporting strong primacy and recency effects. Decline in children's working memory performance was not primarily related to perceptual difficulties alone. The majority of errors was related to the maintenance of sequential order information, which suggests that reduced performance in competing speech may result from increased cognitive processing demands in noise. Recreational music exposure is a potential risk factor for noise-induced hearing loss (NIHL). Augmented hearing protectors have been designed with modified attenuation characteristics to combine hearing protection and listening comfort. However, to date, only a few independent studies have assessed the performance of those augmented protectors in realistic exposure conditions. This study compares the listening experience and temporary effects on cochlear status with different types of earplugs after exposure to contemporary club music. Five different types of commercially available hearing protectors were worn, all commonly used during leisure-time music exposure. Four of them were augmented premolded earplugs and the fifth type was an inexpensive, standard earplug frequently distributed for free at music events. During five different test sessions of 30 min each, participants not professionally involved in music wore one particular type of protector. 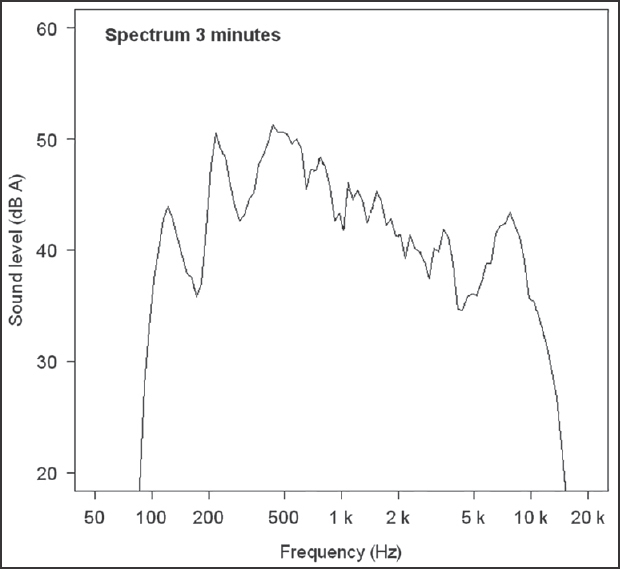 Contemporary club music was played at sound pressure levels (SPLs) representative of concerts and bars. After each listening session, a questionnaire on sound quality and general appreciation was completed. In addition, otoacoustic emissions (OAEs) were measured directly before and after music exposure. The reported appreciation clearly differed depending on the addressed characteristics and the specific earplug type. In this test group, the reported appreciation mainly depended on comfort and looks, while differences in sound quality were less noticeable. The changes in OAE amplitude before and after noise exposure were small in terms of clinical standards. 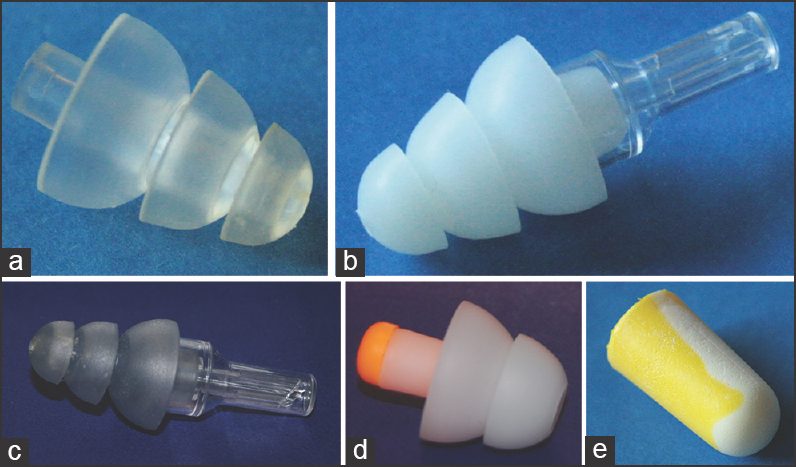 Nevertheless, the observed temporary shifts differed systematically for the different types of hearing protectors, with two types of musician earplug showing a more systematic decline than the others. Further research with respect to actual use and achieved protection for real, unsupervised music exposure is warranted. In mastoid surgeries, contralateral ear noise exposure is a known, identified factor leading to high-frequency hearing loss due to the wide variety of surgical devices that may be used during the surgery. However, the hearing threshold recovery time after this trauma was uncertain. The present study aimed to assess this time. In this prospective survival analysis study, 28 consecutive patients with chronic otitis media who were undergoing tympanomastoidectomy were assessed. Standard pure-tone audiometry (PTA) and distortion-product otoacoustic emission (DPOAE) were measured in all contralateral ears before and 6 h, 24 h, 48 h, 72 h, and 96 h after the surgery. Based on the PTA postoperative hearing loss, survival rates at frequencies of 3000 Hz, 4000 Hz, 6000 Hz, and 8000 Hz were 44.4%, 36.4%, 51.7%, and 47.4%, 24 h after surgery; 11.1%, 9.1%, 10.3%, and 13.2%, 48 h after surgery; and 0%, 0%, 3.4%, and 2.6%, 72 h after surgery, respectively. Based on the PTA and DPOAE, survival rates at all frequencies were 0%, 96 h after the surgery. According to the PTA, mean hearing recovery times were 61.98 ± 26.76 h (3000 Hz), 62.73 ± 26.50 h (4000 Hz), 67.08 ± 25.90 h (6000 Hz), 70.70 ± 24.13 h (8000 Hz), and with regard to DPOAE the recovery times were 58.58 ± 28.39 h (2000 Hz), 63.32 ± 28.83 h (4000 Hz), 65.22 ± 29.13 h (6000 Hz), and 75.14 ± 22.70 h (8000 Hz), respectively. To conclude, high-frequency hearing loss usually occurs following mastoid surgeries that is mainly temporary and reversible after 72 h.
In this experiment, we evaluated the long-term effects of noise by assessing both astrocyte changes in medial prefrontal cortex (mPFC) and mPFC-related alternation/discrimination tasks. 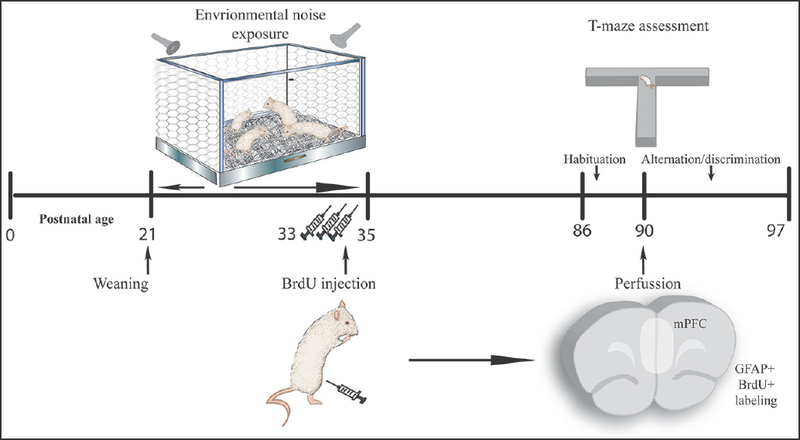 Twenty-one-day-old male rats were exposed during a period of 15 days to a standardized rats' audiogram-fitted adaptation of a human noisy environment. We measured serum corticosterone (CORT) levels at the end of the exposure and periodically registered body weight gain. In order to evaluate the long-term effects of this exposure, we assessed the rats' performance on the T-maze apparatus 3 months later. Astrocyte numbers and proliferative changes in mPFC were also evaluated at this stage. We found that environmental noise (EN) exposure significantly increased serum CORT levels and negatively affected the body weight gain curve. Accordingly, enduring effects of noise were demonstrated on mPFC. The ability to solve alternation/discrimination tasks was reduced, as well as the number of astroglial cells. We also found reduced cytogenesis among the mPFC areas evaluated. Our results support the idea that early exposure to environmental stressors may have long-lasting consequences affecting complex cognitive processes. These results also suggest that glial changes may become an important element behind the cognitive and morphological alterations accompanying the PFC changes seen in some stress-related pathologies. Human locomotion typically creates noise, a possible consequence of which is the masking of sound signals originating in the surroundings. When walking side by side, people often subconsciously synchronize their steps. The neurophysiological and evolutionary background of this behavior is unclear. The present study investigated the potential of sound created by walking to mask perception of speech and compared the masking produced by walking in step with that produced by unsynchronized walking. The masking sound (footsteps on gravel) and the target sound (speech) were presented through the same speaker to 15 normal-hearing subjects. The original recorded walking sound was modified to mimic the sound of two individuals walking in pace or walking out of synchrony. The participants were instructed to adjust the sound level of the target sound until they could just comprehend the speech signal ("just follow conversation" or JFC level) when presented simultaneously with synchronized or unsynchronized walking sound at 40 dBA, 50 dBA, 60 dBA, or 70 dBA. Synchronized walking sounds produced slightly less masking of speech than did unsynchronized sound. The median JFC threshold in the synchronized condition was 38.5 dBA, while the corresponding value for the unsynchronized condition was 41.2 dBA. Combined results at all sound pressure levels showed an improvement in the signal-to-noise ratio (SNR) for synchronized footsteps; the median difference was 2.7 dB and the mean difference was 1.2 dB [P < 0.001, repeated-measures analysis of variance (RM-ANOVA)]. The difference was significant for masker levels of 50 dBA and 60 dBA, but not for 40 dBA or 70 dBA. This study provides evidence that synchronized walking may reduce the masking potential of footsteps. Noise is one of the most pervasive hazardous factors in the workplace. Noise-induced hearing loss (NIHL) is the most common disorder related to noise exposure. Smoking is probably associated with hearing loss. The simultaneous effect of noise and smoking on hearing is a recent concern. 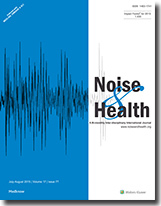 In this study, we assessed the simultaneous effect of noise and smoking on standard pure tone audiometry (PTA) and distortion product otoacoustic emissions (DP-OAEs). This was an historical cohort study on 224 workers exposed to noise who were divided into two groups: Smokers and nonsmokers. DP-OAE response amplitudes were assessed. 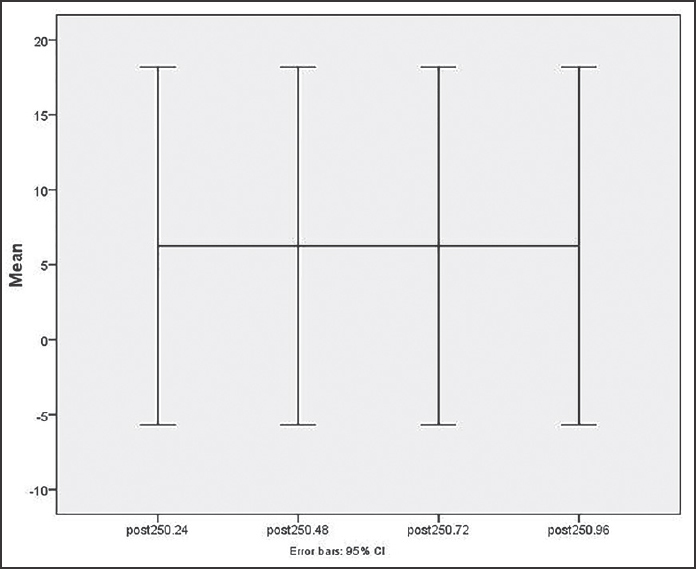 Data were analyzed by SPSS software (version 19) using Student's t-test and Mann-Whitney U test. One hundred and five subjects were smokers (case group) and 119 individuals were nonsmokers (control group). All the subjects were exposed to 91.08 ΁ 2.29 dBA [time-weighted average (TWA) for an 8 h work shift]. Mean DP-OAE response amplitude at frequencies higher than 1,000 Hz was significantly higher in the smokers than the nonsmokers. This study showed that smoking can aggravate the effect of noise on hearing in DP-OAEs.